I fail to see how Apple's included "bundled accessories" for the iPhone and iPad are any different, in any way whatsoever, than a plethora of similarly positioned consumer products on the market that have a wide variety of optional or upgradable 0accessories. You are buying and paying for an iPhone or iPad and Apple is bundling: 1) a fully functional charger, 2) a charging cable, and 3) a set of headphones with your iPhone or iPad purchase. The bundled accessories may not be exactly to your liking or the best ones available that work with the device, but they do work and allow you to fully utilize the device that you have purchased. Can you pay more for a bigger, faster, or more versatile charger? Hell yeah. Can you buy a longer or more robust charging cable? Certainly. Can you pay more for a better and more high quality set of headphones? Yes you can. But you bought the bundle that says it comes with a 5W charger, short Lightning cable, and Lightning EarPods. What is different about what Apple is doing than buying a desktop PC bundle that comes with a basic mouse, keyboard, speakers, and perhaps a 1080p monitor? Or a new Jeep that comes with 16" skinny little wheels and tires and no brush guard? If you buy a package deal at a certain price you get exactly what the manufacturer has decided to include in the packaged bundle for the price. You knew what was in the package when you bought it. It doesn't matter whether your PC's video card can support a 4K monitor if you bought a package that comes with 1080p monitor or if your iMac has 4 memory slots and came with only 2 of them filled or your Jeep is capable of mounting 21" off-road wheels/tires. Wishing or whining that the manufacturer should have included higher quality, higher performance, or higher priced accessories in the bundle you selected, because that's what you want, and at no additional cost to you, is a fanciful concept, but so is Santa Claus and the Easter Bunny. I think a reasonable compromise, for economical and e-waste considerations, would be for Apple to offer customer-defined bundles, with the available higher performance and costlier accessories selectable up-front so you don't end up with "basic" accessories that land immediately in the junk drawer. But this starts to complicate the keep-it-simple approach that has allowed Apple to source massive numbers of new products into its distribution channel almost immediately after they are announced. Adding any additional variation to the process and optional bundling options to an already complex supply and distribution channel is only going to slow things down and drive up costs to consumers. But if customers are willing to accept delivery delays and a bigger hit on their wallet, why not allow them to do so? I thought you needed an adapter 29W or higher to fast charge a compatible iPhone? This article from Apple does not include a 18W adapter as a recommended charger. The lists of supported devices for the 30W and the 18W chargers are the same. I would guess Apple will be updating the kb article you posted in due time. What would be nice is if AI could repeat their Fast-charging tests with this new charger to see if there is a significant difference in charging times with the 18W vs the 30W. I can’t imagine there would be a big difference for the phone, but maybe for the iPads Pro. I would also like to see data for the gen 6 iPad; even though it doesn’t offer fast-charging it may get some improvement over the included 10W charger. iPhone 8 and X models draw 12.48 W (5.2V at 2.4A). iPhone Plus models going back to the 6S Plus could draw about 10 W. So, if you want to go biggest bang for your money, you can get a 10W USBA charger for less than $10. ”Fast charging” is just a vacuous name companies and media use to say that this or that device can draw more power than the traditional USBA specification of 5 W (5V at 1A). Charging bricks have to be able to supply that right amps and volts to support whatever the device expects. In the case of the 18 W and 29 W, etc, USBC charging bricks, they have multiple output power that they can deliver. 5.2V x 2.4A = 12.5 W will be one of them, and that is what modern iPhones will use. iPads and Macs will use the higher output levels from Apple’s charging bricks, that correspond to the max draw of those devices. Ie, an iPad won’t be drawing 60 W from Apple’s bigger charging bricks, just whatever the max an iPad can take, which is probably 18W for 2018 iPad Pros. When using USB-C lightning cables iPhones starting with the 8 and X support 5v/3a for 15w and 9v/2a for 18w charging. I don’t know if it is true and would like to see definitive proof, both on the charging brick and phone side. I’ve only ever seen 8 and X models support 12.5W. If they support 18W, you could charge a 10.5 WHr X battery in 45 minutes, or get to 50% in 20 minutes. That’s definitely testable. I would bet a lot this 18W charger outputs 5.2V x 2.4A and that is what iPhones use, while only 2018 iPad Pros and probably the MacBooks can draw 18W. I’m wondering if this would have any benefit or possibly even be harmful with pre 8 iPhones. No, there won’t be. Benefit or harm. The vast majority of users get along fine w the 5W. I charge my iPhone overnight. Plug in at work or car when I'm low. Rinse and repeat. That is not evidence at all; the vast majority of users use whatever comes in the box. 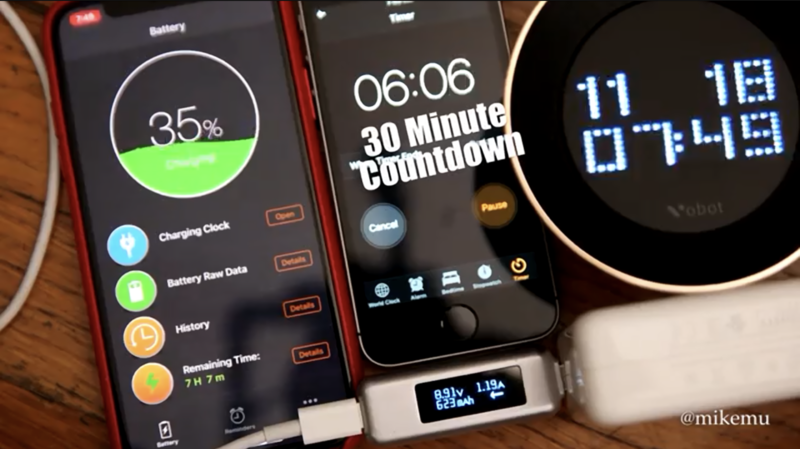 By your standard, 5W is too much; since 3W will charge your iPhone overnight. Unfortunately cheap is slow, while most users of $1000+ iPhones place a premium on time and often charge their phones during the day. few of the tests include the iPad or use all Apple chargers and of course none of them include this particular, newly released charger. Additionally, as I'm a regular reader of AI (because they focus on Apple gear), I would like to have the information from my go-to source. On paper, Apple's 18W charger should perform the same as any other 18W charger (from Anker, Belkin, etc. ), but the fact that there is some difference in how Apple's devices charge with different brands of chargers seems to indicate Apple has included some "secret sauce" into their own chargers. Since there is a $20 difference between the 18W and 30W (and a $10 difference between the 12W and the 18W) it would interest me to know what, if anything, we get for that extra Jackson (or Hamilton). The difference would be that Apple has never been in the business of being just any other option on a market where everything's basically just the same. Including a 5W charger with a 1250 USD iPhone XS Max isn't just to include the basic model, but more akin to getting a laptop with a CD-ROM unit in it. It's just straight up outdated, and a bottleneck performance-wise. People had to charge their phone over night simply because by the end of the day it was very low on battery, and it took a long time to charge it; so people lay there in bed with a wired iPhone, with a cable that wasn't long enough for comfortable use. User experience-wise it'd be a HUGE win if Apple included either an 18W charger, to allow the phones to quickly be topped up during the day, or a wireless charger. Our iPhone 8 and X have a Lightning connectors. What good is a fast charger with USB-C to us? It's not so much that the included charger does the job but that the charger has no place in the current phone world, much less the premium phone segment. It should have been retired long ago. Having a $1,000 dollar that you have to adapt to to charge (overnight for example) when a far superior solution exists. Apple is deliberately shipping 5W chargers knowing full well that that action will encourage users to pay even more to get a faster standalone option with all the flexibility it provides. Uhh, I guess you’ve never seen the lightning to USB-C cables? If what you say is true, why does Apple include crap earphones with every iPhone they sell, regardless of price? Heck, with the iPod Touch they don't even include the crap earphones with the remote control on the wire, but only a reduced functionality set. This is just how accessory bundling works and Apple is no different than anyone else on the market. What is different with Apple are the products like the iPhone, iPod Touch, and iPad. The products that differentiate Apple from competitors are what matters, not the extra bits they throw in the box. I don't see fancy commercials with floating and gyrating images of 5W chargers backed by throbbing music. If you have an iPad Pro, you’ll need to verify that it can draw more than 18 W. For the 2018 iPad models, the 18 W charger (maybe either 9V at 2A or 6V at 3A) will work for obvious reasons. The iPad Pro needs to suppport, be able to draw, the power that that 30W charger can deliver. It may be that they will only draw 18W and therefore no need to buy the 30W. Reviewers can simply clear this up by reading the max output V x A values that all companies are required to print on power supplies, and buying an in-line USB power meter. They don’t need to do charge time tests. If you get the 29W USBC charger from Apple for your iPhone or iPad, odds are pretty good that they will draw from the 5.2V x 2.4A = 12.5W output profile. So, I wouldn’t recommend buying this for iPads unless it’s been verified that it can draw power at 14.5V at lower amps (like 1.24A). The new 18W charger will obviously be better if so. If someone has an iPad Pro 12.9 with a 120 min charge item from 0% to 100%, than it is drawing 25 to 30 W, but I haven’t seen it. This is a feature race that Apple has gladly withdrawn from entering. If having the fastest charge time possible is a big feature a buyer, they can get a Huawei or an Oppo or a Samsung. I definitely think it is not a must have feature. It’s nice to have, but it isn’t something the bulk of the market is looking for. The vast majority of the market just charges overnight. Hence, a 5 W charger is perfectly fine. If people want to charge their iPhones faster, that niche can get it by getting a more powerful charging brick which will decrease charge times by a factor of 2. In my other post, a 10 W USBA charger is the best bang for the buck as people can get those for <$10. If someone values charging in the least time possible the most, Apple is saying go buy a Huawei phone. A lot of Mac users also have a nice side benefit as Mac computers have USBA ports that can deliver 2.1 A for 10 W of charging, and USBC ports can go to 15 W I think. Not sure on the TB3/USBC port power output actually, but I do think it is about 10 W. So, Mac users who are charging their iPhones and iPads with their Macs get a nice charge rate out of them. This is what I grabbed from Apple.com.. Seems you need to step up to the 29W charger to take full advantage of the fast charge ability of capable devices..
Two years ago I bought the most expensive laptop Apple made. It's exclusively USB-C. It's a little annoying to then buy a top-of-the-line iDevice and receive an incompatible cable. Fine, despite me delivering the maximum revenue to Apple in each category, *I'm* the one who has to buy a new cable, not the person who bought cheap stuff. Again, annoying but understandable. But then the price of a 2m USB-C/Lightning cable is 50% more than the USB-A version! @#$%[email protected]!! At the VERY least, Apple could provide the USB-C cable at the same price as the USB-A version. Obviously there would be outrage if Apple included USB-C accessories with iDevices, but it's still irksome to those who've dropped long coin on Apple's best products to not only be charged extra for accessories that are free to everyone else, but to then also be charged much higher prices for those accessories. The Knowledge Base article isn’t that useful as it does tell you how much power the supported devices draw. People shouldn’t be buying the 30W USBC charger if an iPad only draws 18 W, or 12W. Best bang for the buck for iPhone owners is a 10W USBA charger. And if people travel a lot, an external battery that can deliver 10 W, not the 5 W that you see in a lot of the cheap external batteries.